Men prefer minimal effort with maximum results when it comes to skin care. And there is only one way to achieve this: With a small handful of properly mixed formulas designed to get it right the first time. For the morning ritual, Neutrogena’s 2-step system involves their Invigorating Face Wash and Triple Protect Face Lotion. The wash is awesome, featuring a mantastic fragrance, and cooling/invigorating tingle that helps wake up the skin as well as your senses. The wash has a good thick formula, and we found you really don’t need much to get good results. It does take a good bit of rinsing to get it completely off, but the clean feeling afterward makes it worth the extra effort. The Triple Protect Face Lotion is smooth, non-greasy, lightweight, and offers a similarly, manly scent. But don’t worry, the scent won’t hang around long enough to compete with your cologne. It is just there to give you some extra morning mojo. The Triple Protect also features SPF 20 protection, which is a good option for daily activities that don’t involve too much direct contact with the sun. However, if you have a day planned out with lots of sun activities, we recommend using one of Neutrogena’s SPF 30 formulas or higher. For shaving days, we went straight for the Razor Defence Face Scrub, followed by their Sensitive Skin Shave Cream. The cream is very slick, allowing your blade to slice violently through a stubborn beard while gliding gently over sensitive skin. It leaves little to no burn or irritation from our experience. We followed this up with their Post Shave Balm to further soothe the skin and then topped it off with Neutrogena’s Triple Protection Face Lotion. 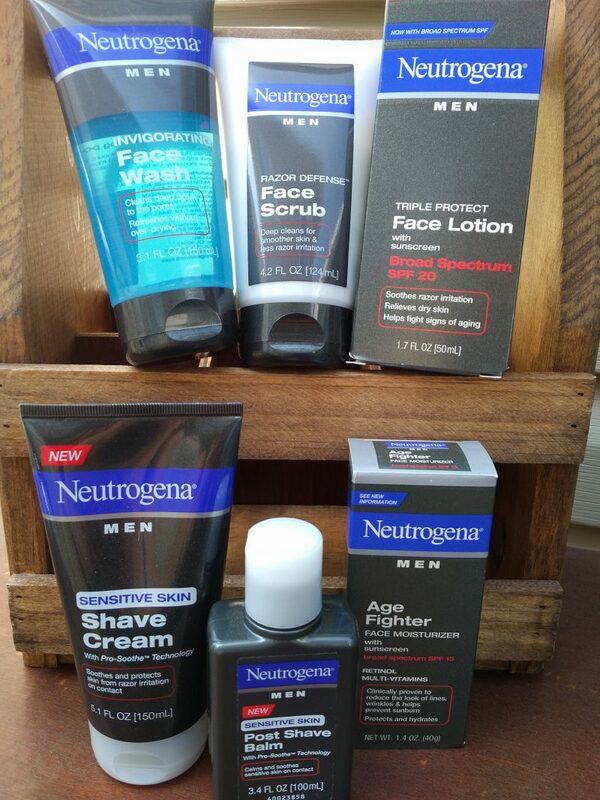 Neutrogena has put together a nice shave system here. They’ve got it narrowed down to the essentials of a good shave, including exfoliating the skin, softening the hair, and protecting your face throughout the process. Their shave balm is a nice finishing touch for those with sensitive skin, but if you usually don’t get irritation from shaving, you could probably get away with skipping this step and going straight to the SPF lotion. The Invigorating Face Wash heads up the evening ritual once again, followed by their Age Fighter Face Moisturizer. The age Fighter can also be used in the day, as it does feature a bit of SPF protection (SPF 15 to be exact). However, for the men who are currently on a preventative program – meaning you don’t have any wrinkles to speak of – we think that using at the end of your day is a good way to keep any forthcoming wrinkles at bay. For men with a bit more mileage on the odometer, we might recommend using the Age-Fighter formula for both the morning and evening ritual. The Age-Fighter offers a combination of Retinol and vitamins to help reduce the appearance of wrinkles and/or other damage. And if you have never seen the results of Retinol, it should give you a noticeable decrease in fine lines in about 2 weeks of continuous use. Yeah, we really liked this evening nightcap, and highly recommend it. Overall we are impressed with Neutrogena’s 2-step (a bit more for shaving) skin care for men. It offers the results of much more expensive and flowery smelling systems, but with fewer steps, a manlier scent, and a formula made for a man. However, as “girl” tools go, we still recommend their Light Therapy Acne Mask if maintaining clear skin is an issue for you, we just recommend doing a lot of manly stuff while wearing it (if someone cool is watching). 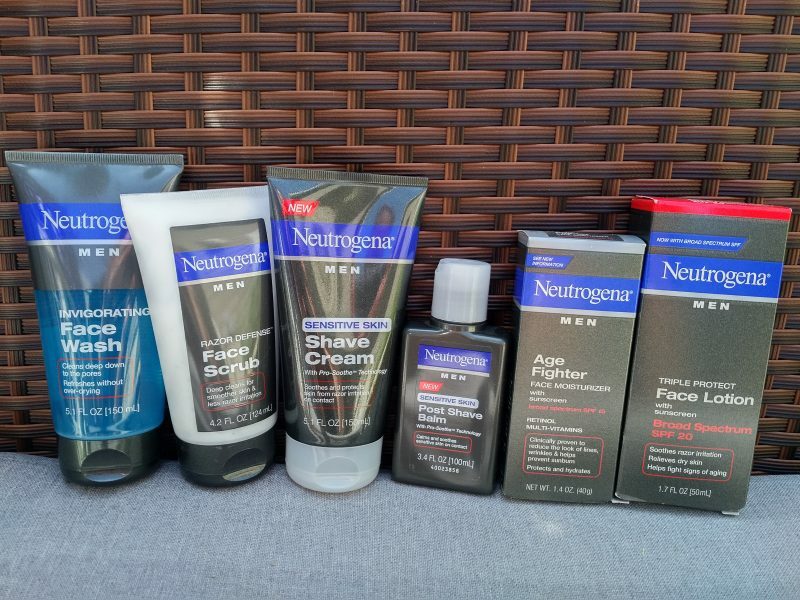 Check out Neutragena’s full skin care line for men on their website. And we remind you that all opinions are true and from our own experience, even though we do occasionally receive vendor/brand sponsorship’s for mentioning products and services.